Incidences of public disorder, and the manner in which they have been suppressed, have repeatedly ignited debate on the role of policing, the effectiveness of current legislation and the implications for human rights and civil liberties. These same issues have reverberated throughout British history, and have frequently resulted in the enactment of new legislation that reactively aimed to counter the specific concern of that era. 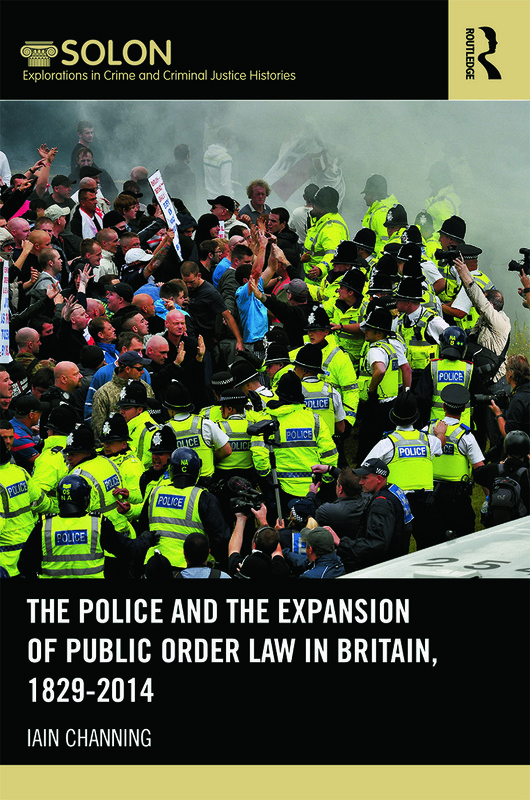 This book offers a detailed analysis of the expansion of public order law in the context of the historical and political developments in British society. The correlation of key historical events and the enactment of consequent legislation is a key theme that resonates throughout the book, and demonstrates the expanding influence of the law on public assemblies and protest, which has continued to criminalise and prohibit certain social behaviours. Crucial movements in Britain’s social and political history who have all engaged in, or have provoked public disorder, are examined in the book. Other incidents of riot and disorder, such as the Featherstone Riot (1893), the Battle of Cable Street (1936), the Inner City Riots (1980s) and the UK riots (2011) are also covered. By positioning legal developments within their historical context, the book demonstrates the ebb and flow between the prominence of the competing demands of the liberties of free expression and assembly on the one hand and the protection of the general public and property on the other. This book is essential reading for academics and students in the fields of criminology, history and law. Introduction Chapter 1. The Development of Public Order Law Chapter 2. ‘I Predict a Breach of the Peace’: Police Discretion and the Tension between Liberty and Order Chapter 3. Riot and Violent Disorder: Controlling Spontaneous Disorder and Excessive Police Violence Chapter 4. Freedom of Assembly and Public Processions: Issues related to promoting opinions and provoking disorder Chapter 5. Policing Public Processions after the Public Order Act 1936 Chapter 6. Public Meetings and Freedom of Expression: The Criminalisation of Words and Political Censorship Chapter 7. Public Meetings held on Private Premises: The roles of the steward and the police Chapter 8. Dressed for Disorder: The Criminalisation of Political Uniforms Conclusion. Iain Channing is an interdisciplinary researcher at Plymouth University. Dr. Channing's research traverses the fields of Law, Criminology and History and he has presented his research at various conferences around the UK. He is the Membership Secretary of SOLON and has a particular interest in the history of public order, political extremism and the police. This series is a collaboration between Routledge and the SOLON consortium (promoting studies in law, crime and history), to present cutting edge interdisciplinary research in crime and criminal justice history, through monographs and thematic collected editions which reflect on key issues and dilemmas in criminology and socio-legal studies by locating them within a historical dimension. The series emphasizes inspiring historical and historiographical methodological approaches to contextualise and understand current priorities and problems and aims to highlight the best, most innovative interdisciplinary work from both new and established scholars in the field, through focusing on the enduring historical resonances to current core criminological and socio-legal issues.